Last time, I was explaining how I became the proud owner of a darkroom setup, and how I came to receive all my awesome loot. Part of that package was a Watson bulk film loader. For those of you who don't know, rather than buying a bunch of individual rolls, you can purchase a 100ft spool of film and, with reusable film canisters, roll your own film. There's a slight economic benefit to this - at Bluemoon Camera and Machine, a 100ft roll of Ilford HP5+ is $67.50. When you roll it yourself, you get can around 20 rolls or so, which makes it $3.37 a roll vs $6.10 individually. Anyway, the Watson roller provides a light proof compartment, as well as a light trap so you can safely roll your film. When I got home with my box of goodies, I was super excited to play with all my new developing toys. I had no idea how the bulk film loader actually worked, so like a curious man-child, I opened it up to see how it worked. I cracked open the light-sealed compartment to discover an almost complete 100 ft roll of film. I sat there, wide-eyed, gaping at the fact there was film in the loader, and then realizing that i just exposed the entire thing to light. Feeling defeated, I continued to look through the rest of the stuff. As it turns out, the previous owner had already rolled around a half-dozen rolls of film. Of course, like an idiot once again, I cracked one of these puppies open and ruined yet another roll of film. I found the product card among the box of stuff. The film in the loader was Kodak Tri-X Pan film. The previous owner loaded the rolls in March of 1985. The roll of film expired in 12/1986. With 5 rolls left of this stuff, I popped a roll in my Olympus OM-1, and shot off a test roll. 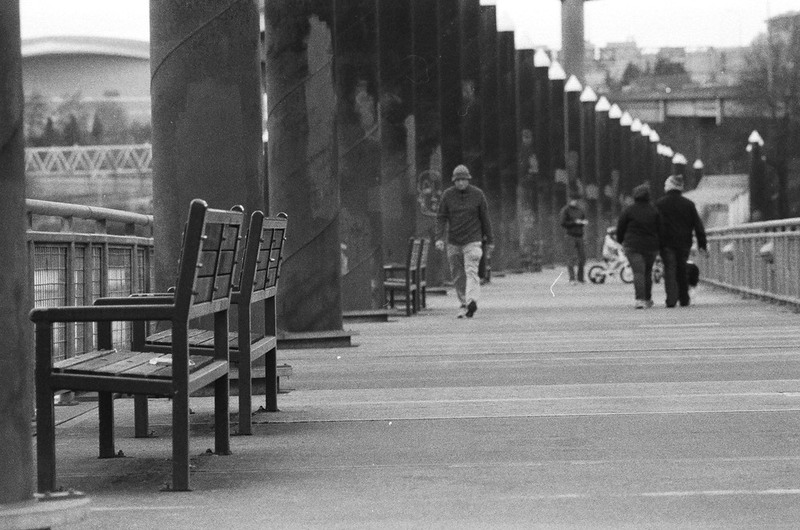 I took a few shots around my house, and the next day went out to the Eastbank Esplanade across from downtown Portland and finished off the roll. Most of the shots were taken with newly obtained Olympus E.Zuikos Auto-T 135mm f/2.8 lens (BEAUTIFUL portrait lens I might add....). 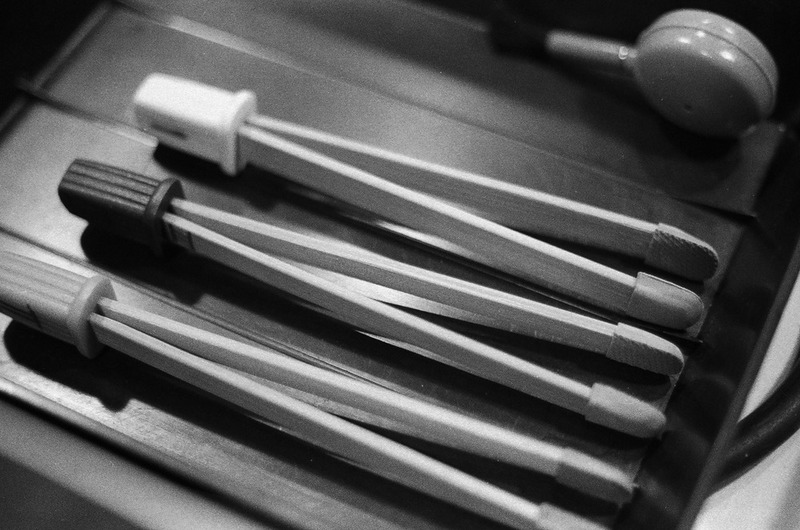 I shot the roll at 200 ISO to compensate for the age of the film, and was developed in Kodak D-76 at 400 ISO. And behold, to my utmost surprise, all the pictures came out. Quite beautifully I might add. I love the big, thick pieces of grain. Newer emulsions these days are trying to minimize it, but it shines here. Film as old as I am (27 years old!) still produces great pictures, with no fogging or other weird artifacts. Also, this was the first roll of film I ever developed on my own. So I suppose this one has a little extra meaning to me. As for the remainder of the bulk roll I "ruined", I spooled off a good 3 or 4 rolls, and developed it to see how much light damage there was. By the last roll, the majority of the frames were ok (only about 5 or 6 ruined. So perhaps I can salvage a few more rolls of this ancient film. And it was a good exercise to practice developing in any case.